I’ve been a fan of barcamps for a while, and have been going to any that I can for at least ten years. 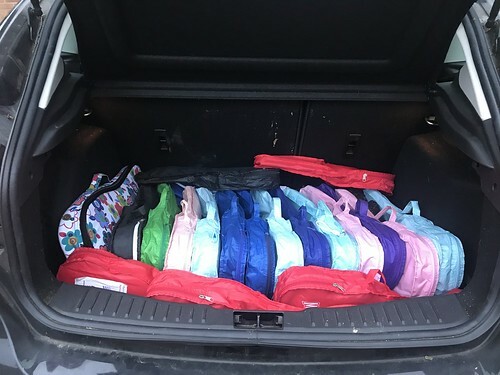 In recent years, I’ve encouraged my kids to come along with me, and in the spirit of barcamp, to think of something they could bring to share or talk about. Grace did a talk about her experiences being taught ICT at primary school at Barcamp Berkshire in 2013. 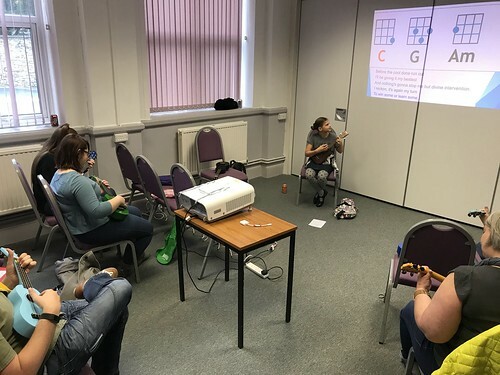 Grace did a demo of how kids are taught to do sums in school today at Barcamp Bournemouth in 2014. 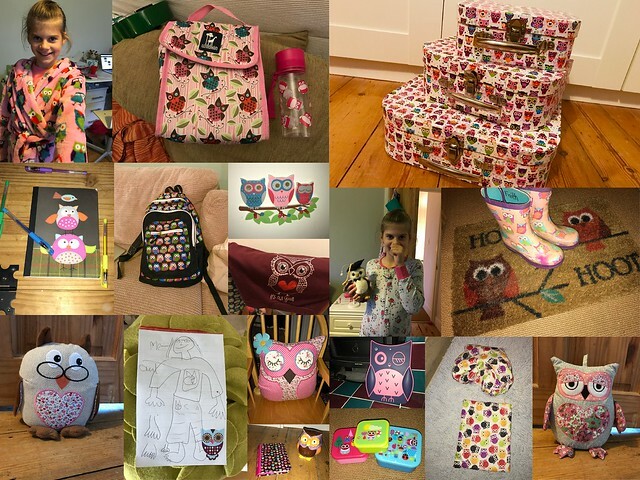 Faith did a talk about owls (and chatbots) at Barcamp Southampton in 2016. 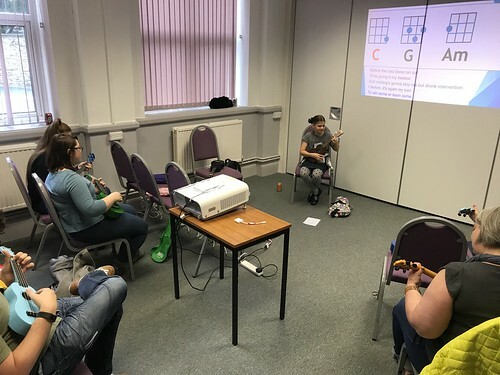 Last Saturday, it was Barcamp Southampton again, and Faith decided to run a session. This time, she chose to do a ukulele lesson. She set up the room with a ukulele on every seat for everyone who came to her session. And she’d made a few PowerPoint slides with finger patterns on to help get people started. Before too long, she had a bunch of adults (who’d never played ukulele before!) strumming along, leading us all as we echoed her strumming patterns. We sounded okay by the end! I was super proud of her. There is no way I’d have been brave enough to try it when I was her age. And, like her sister, it was a more creative and fun idea for a talk than the usual stand-in-front-of-slides-and-talk sessions that I always do. Last weekend was Barcamp Berkshire. Barcamps are something I’ve explained before. In short, they’re conferences where each attendee contributes a session on any topic they want. This makes for an unplanned and eclectic mix of talks, presentations and discussions representing the wide range of hobbies, skills and experiences of the people who happen to be attending. It’s not particularly new that I went to a barcamp, as I’ve been going to things like this for many years. What was new was that this time, I brought Grace. 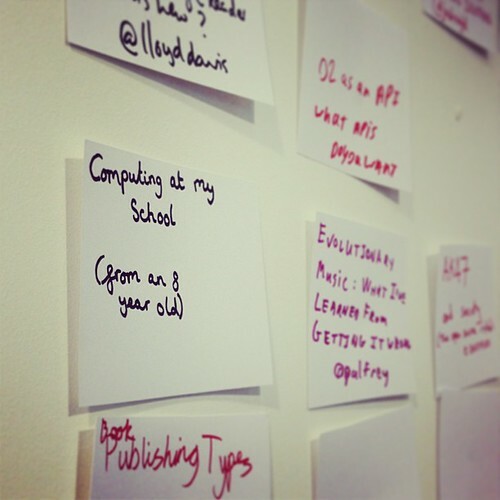 Last week, I went to BarCamp London. As always, it was a great weekend. If you’ve not been to something like this before, the idea is that it’s a conference where each attendee contributes a session. There’s no real theme – just talk about something interesting. You end up with an agenda made up of the interests, hobbies and skills of the random collection of people who managed to get a ticket. It makes for a more varied and eclectic agenda then you get from a traditionally organised conference. Saturday 25th April saw the return of HomeCamp. 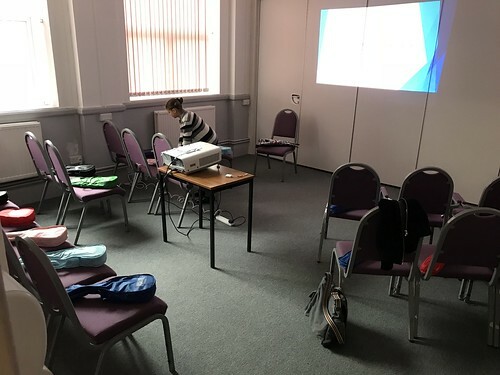 HomeCamp started last year as the brainchild of Chris Dalby, aiming to bring together a growing community of people interested in “green” hacking and technologies. I’ve had this post sat in draft for weeks now, meaning to come back and turn them into proper notes. As it’s been a few weeks now and I still haven’t, I thought I might as well post my rough notes as I took them on the day. Apologies that they’re a little sketchy! I blogged about it at the time, but in short it was a fascinating weekend that brought together a great group of people. There will be another bathcamp event, but the organiser Mike Ellis had the very neat idea to keep the momentum going in between the full barcamp weekends with a series of monthly evening meetups. 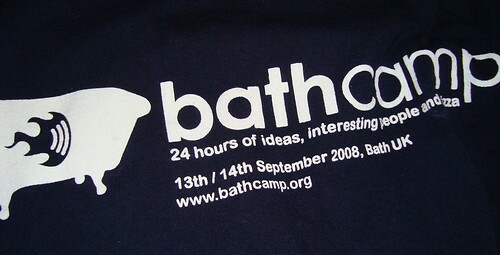 The first Wednesday of every month, BathCamp becomes an evening event at Revolution in Bath. It works really well, keeping the sense of community going in between the full barcamps. Many turn up early, in time to have a drink and something to eat in the bar downstairs. You get a group of people all sat together, but it’s very welcoming and friendly. You can sit next to anyone there, and get involved the conversation – not always the case with every geeky meetup I go to. At about 8pm-ish, everyone goes upstairs for an informal presentation on some tech topic of interest. Then there is a break where everyone gets themselves a drink, and talk and bounce around ideas about the presentation. Then another (generally somewhat related) presentation from a second speaker, and another chance to talk about the topic with everyone else there. These bits make a difference – sometimes these events can drift into “turn up, listen to talk, go home”. But so far, the Bathcamp meetups have been a long way from that.